In honor of Banned Books Week, we’d like to share the following review. To learn more about Banned Books Week, visit www.bannedbooksweek.org. When I was in undergrad, a friend of mine wrote a story called “The Dumbest Person Who Ever Liked Ulysses.” The piece was a comedy that followed the day of a gym teacher who was a fan of James Joyce’s masterpiece, while making (then topical) jabs at the TV show 24. As you might guess, the premise was based off a commonly held assumption: you have to be pretty smart to read Ulysses. Famous grumpy person Jonathan Franzen is probably the loudest person to espouse this point of view, but he’s hardly alone; last year, for example, the increasingly less famous Paulo Caelho declared that Ulysses was harmful to literature. The root of this argument is that Ulysses is hard to read, and, of course, no one wants to read things that are hard to read. Instead, you’re much better off reading The Corrections, The Alchemist, or some other book that doesn’t take a lot of brain power to digest. Leave Ulysses to the writers and the scholars. Now, I’m not a dumb guy. I’m a writer. I have a MFA. Like my fellow elitist snobs, I divide my time between writing stories, adjuncting at a community college, and watching Murder, She Wrote with my girlfriend. So of course I like Ulysses. But hear me out. Ulysses doesn’t just appeal to me as a pompous, egghead writer; it also appeals to the small part of me that’s left that isn’t a snobby monster: my heart. Clearly, the book is a triumph of style; Joyce’s uncanny ability to test the boundaries of language are unquestionable (even to grouchy folks). But style aside, Ulysses is full of the strange complex joys and miseries of being human. Nowhere is that clearer than in the final episode of the book: Molly Bloom’s soliloquy (yes). The scene is a nearly unpunctuated lyrical rambling from a woman who is having an affair despite the fact that she still (spoiler alert) loves her husband. Molly is presented to us as an incredibly rounded character, someone who is worth being emotionally invested in. Compare her to Joyce’s other creation, Anna Livia Plurabelle, from Ulysses’ less successful little brother, Finnegans Wake (another book you should definitely read, despite its “difficulty” warning). Anna is a walking, talking symbol, representing a number of different concepts that permeate human existence. She’s incredibly amorphous; some critics dispute the fact that she even exists. Anna closes out (and re-starts) Finnegans with a similarly beautiful (and nearly indecipherable) soliloquy, comparable to Molly’s in its execution. The key difference is that Molly Bloom is a living, breathing character. We are not just moved by the emotion of her words but by the emotion of her being. Strip away the style of Anna, and you have something akin to a rambling essay; strip away the style of Molly, and you still have the essence of human complexity. I do think that what Joyce does with Anna is an incredible feat (that’s another essay for another time), but on a basic, working class level, how am I supposed to emotionally connect to a monomythical symbol of matronly love? At the same time, how can I not relate to the all-too-human contradictions of Molly Bloom? As a writer, Joyce appeals to me most because the evolution of his writing is so clearly documented. Reading Joyce’s fiction, from Dubliners, to Portrait, to Ulysses, to Finnegans, you can see a writer frustrated with what fiction had to offer him, and you can see him push and break beyond those limitations (admittedly, with varying degrees of success). That has served as a roadmap for my own writing. Why should we as writers be comfortable writing only the same things over and over and over again? How are we to grow and test are abilities if we are content to write only in the same style? Why should we be so scared to fail? The same should be true of readers: why should we be scared of not understanding? Why should we be content with retreading the same ideas and styles and concepts? Why should we be so scared to read? 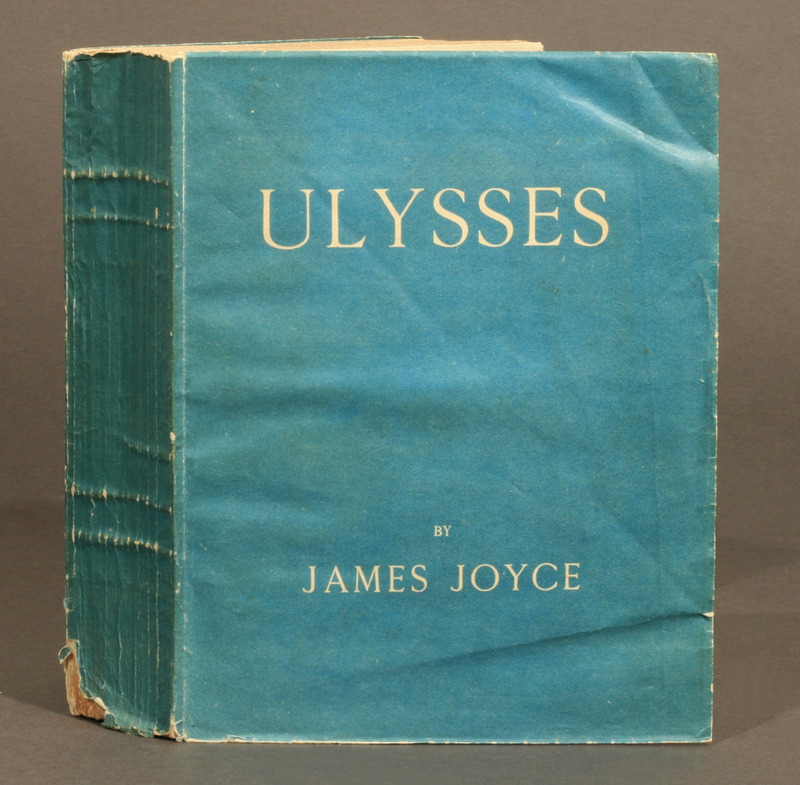 Ulysses was banned in The United States from 1921-1933.